ASP.NET web developers have three built in options to store session state, namely, in-process memory, SQL Server and State Server. In-process memory offers the fastest performance but is unsuitable for use in web server farms because the session data is stored in the memory of the ASP.NET worker process. SQL Server is an out of process session state storage option that works with web server farms. It stores session data in a SQL Server database. It is the most reliable option but the least performing one. One major issue with this option is that quite often developers want to cache data retrieved from a database in session state, to reduce database lookups. SQL Server session state defeats this purpose, because there is little performance gain in caching data retrieved from a database, in a database. State Server is an out of process session state storage option that works with web server farms. It stores session data in memory and delivers better performance than SQL Server. This seems like a good compromise between the in-process option and the SQL server options. It has some drawbacks, however. Firstly, several web servers typically depend on one state server for session state which introduces a critical single point of failure. Secondly, in a load balanced environment, the load balancer may redirect a user’s request to a web server that is different from the web server that served the user’s previous request. If the new web server communicates with a different state server, the user’s original session state will not be found and the web application may not work properly. This problem occurs even in persistence-based (aka sticky) load balancers either erroneously or due to server failure. Thirdly, an issue that many developers are unaware about is that the web server and state server communicate in plain text. An eavesdropper can easily get hold of session state data traveling on the network. This may not be a threat if all servers are running in an internal network but it is certainly cause for concern when web servers and state servers are spread across the internet. The peer to peer ASP.NET state server presented in this write-up addresses the aforementioned problems while transparently replacing the Microsoft provided state server. 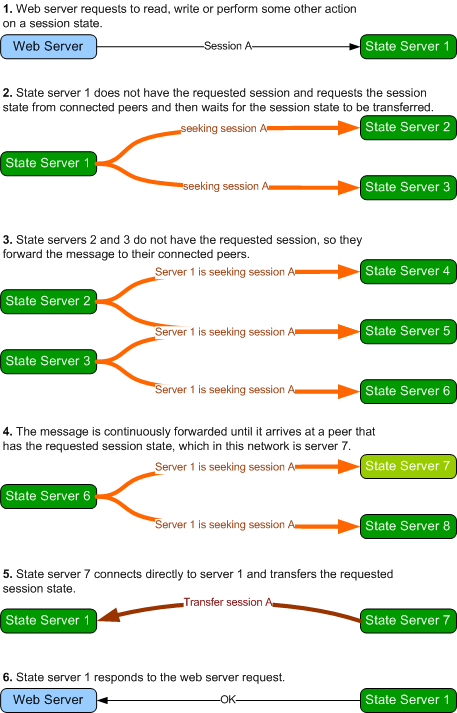 The idea behind the peer to peer state server is simple -- let state servers on a network securely communicate and pass session state data amongst each other as needed, as shown below. This design improves scalability because web servers can share multiple state servers, eliminating a single point of failure. Furthermore, if a load balancer erroneously or intentionally redirects a user to a different web server attached to a separate state server, the user’s session state will be requested from the state server that served the user’s previous request. Security is also improved as peers can be configured to encrypt session data while sharing session state. Data transfers between the web server and the state server remain unencrypted but eavesdropping attacks can be eliminated by keeping web servers and linked state servers in trusted networks or on the same computer. The peer to peer state server is fully backward compatible with the Microsoft provided state server and comes with all the benefits mentioned earlier. The state server comes in two flavors. One runs as a console application and the other one runs as a windows service. The StateService project compiles as a windows service and can be installed and uninstalled with the install_service.bat and uninstall_service.bat files. The ConsoleServer project runs the service as a console application, which is a lot easier to test and debug. Both projects share the same sources and function identically. Open up the properties window for the project you want to build. a. If using Visual Studio 2005, add NET20 in the conditional compilation symbols field of the Build tab. b. If using Visual Studio 2008, select .NET Framework 3.5 in the Target Framework field of the Application tab. If you built the StateService project, navigate to the output folder and run install_service.bat to install the service. If you are already running the Microsoft state service on your machine, stop it. If you built and installed the windows service, you can start Peer to Peer State Service in the Services list. If you built the console server, run ConsoleServer.exe or simply start debugging from Visual Studio. You can now test and run any web applications you have with the running state server. Copy the compiled executable file and the application configuration file to another computer on your network. Open up the configuration file and add a new peer in the <Peers> section. For instance, to configure the state server to connect to another state server running on a computer named SV3 with a peer port number of 42425, you would add <add key="MyPeer" value="pc2:42425" /> to the <Peers> section. You can start the state server on the computer and it will link up with the other state server(s) on the network. You can run multiple console server peers on the same computer but each console server must have a unique web server port and peer port setting. The Microsoft provided state server, works as shown below. If the requested session state is not transferred within a set time period, the state server assumes the session state does not exist on the network and proceeds to process the web server request without the session state. 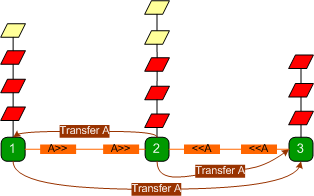 The GetTransferMessage class represents the message that is broadcast on the network when a node is requesting a session. Peers maintain connection between themselves principally to forward this message. 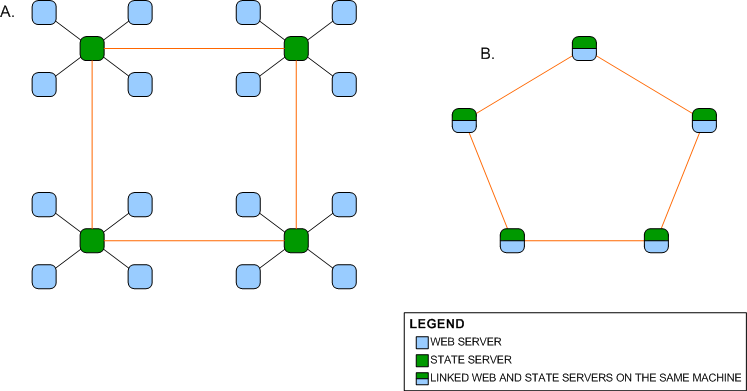 Session state transfers occur out-of-band of the peer network. Various programming techniques are used to implement different aspects of the state server. Some of the notable ones are highlighted below. The state server is written in C# 2.0 but targets the NET 3.5 framework so as to take advantage of the ReaderWriterLockSlim class. If the NET20 symbol is defined, the server uses the slower ReaderWriterLock class instead and is able to target the .NET 2.0 framework. When the server receives data from a socket, the data is accumulated in an instance of the HTTPPartialData class currently assigned to that socket. The HTTPPartialData instance validates the data, determines if the accumulated data is a complete HTTP message and checks for errors in the accumulated data. If there is a data error (for example, if the data does not conform to HTTP), the entire accumulated data is discarded and the socket is closed. If the data is valid but not yet complete, the sockets waits for more data to arrive. 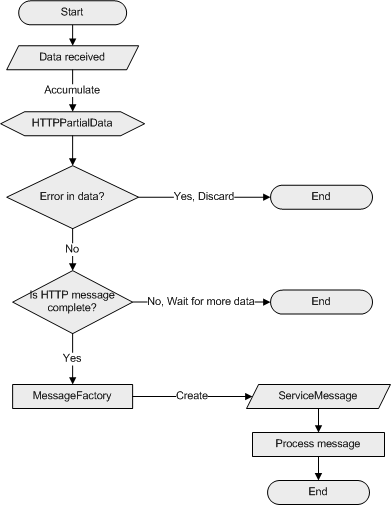 If the accumulated data is a complete HTTP message, the data is sent to a MessageFactory object. The MessageFactory object inspects the data to determine the appropriate ServiceMessage child class instance to create. The ServiceMessage child class is instantiated and its implementation of the Process method is called to process the message. A pessimistic concurrency mechanism is employed while accessing session state in the session dictionary, which is defined by the SessionDictionary class. A piece of session state can only be read or modified by one thread at a time. A thread declares exclusive access to operate on a piece of session state by setting the IsInUse property to true. This is done by calling the atomic compare and swap CompareExchangeInUse method (a wrapper to the .NET Interlocked.CompareExchange method that operates on the IsInUse property). Setting this property to true lets other threads know that another thread is working with that session state. If another thread wants to access the same session state and attempts to declare exclusive access, the attempt will fail because another thread already has exclusive access. The thread will keep trying to acquire exclusive access, and will eventually acquire it when the other thread releases access. This works pretty well because most of the time, only one thread needs to access a session state, and also because most operations on a session state take a very short time to complete. The export (transfer) operation which takes a much longer time is handled with a slightly different mechanism and is discussed in the contention management section below. The code has a lot of objects that expire or time-out and on which certain actions must take place on expiration – objects like individual session state dictionary entries that expire or asynchronous messages that timeout. Instead of assigning a timer or a wait handle to track these objects – they are stored in instances of a special collection class called the DateSortedDictionary. Objects in this dictionary are sorted in place by their assigned timestamps. Specially designated threads poll these date sorted dictionaries for expired items and perform related actions if an item is expired. This design significantly reduces the number of threads needed to keep track of expiring items. The Diags class is used to keep track of messages, log server activity and detect deadlocks. Methods on the Diags class are conditional and will not compile into release configuration code. The VERBOSE symbol can be defined to view or log all activity taking place at the server. 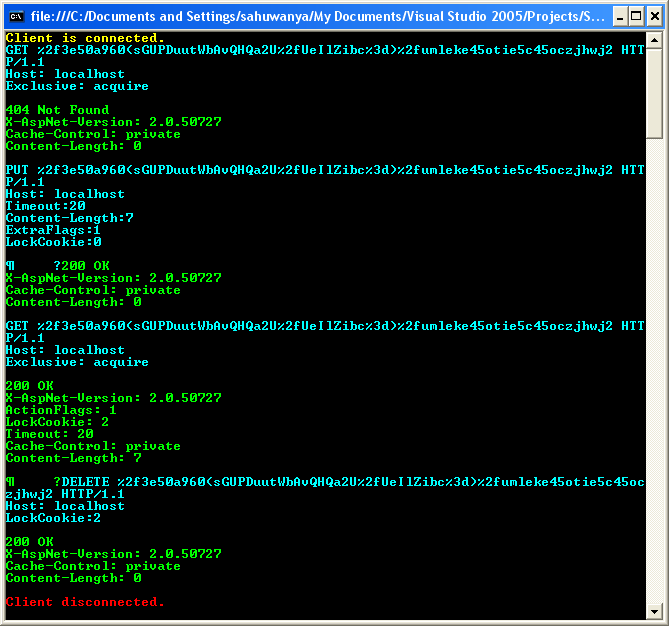 This is particularly useful with the console server which outputs this information to the console window. If the VERBOSE symbol is not defined, only critical information or unexpected errors are displayed. The Microsoft provided state server transmits and receives unencrypted data to and from the web server. This was most likely done for performance reasons. To be compatible with the Microsoft provided state server, the peer to peer state server transmits unencrypted data to the web server. However the peer to peer state server can be configured to transmit encrypted data between peers. This effectively thwarts network eavesdropping attacks if web server and associated state servers are installed on the same computer or on a trusted network. For example, take the Web server – Microsoft State Server configuration shown below. Two web servers connect across the public internet to access a state server. The local state servers can be installed on the same machine as the web server for maximum security and minimum latency. This approach can help secure geographically distributed web and state servers. 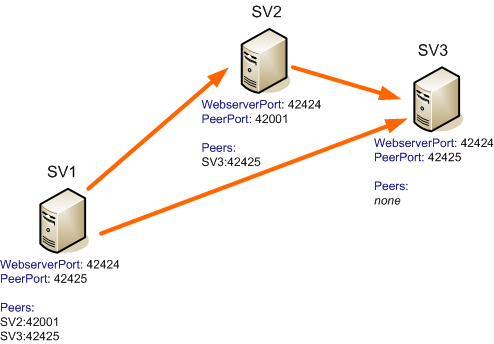 Peer state servers also mutually authenticate each other while connecting, to ensure that the other party is an authorized peer. Connections between peers form logical networks which can be designed with common network topologies in mind. 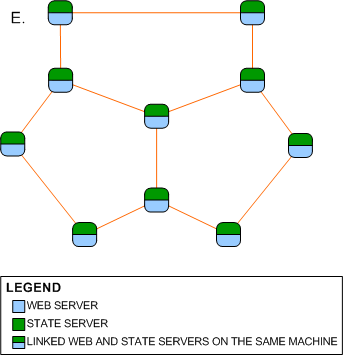 Network A shown above is a ring network of peer state servers which are individually connected to web servers whereas Network B is a ring network of computers which have both state server and web server connected and running. Existing isolated Microsoft state server networks can be upgraded to form a larger peer to peer network by replacing the Microsoft state servers with peer to peer state servers and linking them up as shown in Network A. Network B benefits from the security counter measures mentioned earlier and is somewhat more scalable since any node on the network is a web server and a peer state server. Both networks will still function if one node fails, unlike on a bus network, however as more nodes are added to the network, the longer it takes for a message to traverse the network. Network C is a star network. An advantage of having a star network is that no matter how many new nodes are added to the ring network, it takes only two hops for a message to reach any node on the network. Network D is a network of three star networks that form a larger star network. This network too will require a lesser number of hops for a message to traverse the network. Both networks suffer from the disadvantage that if the central node fails, the entire network fails. By connecting the leaf nodes on Network D, Network E, a partial mesh network is formed. Network E is a clever combination of a ring network and a star network. If the central node fails, the network will still function and it also takes a fewer number of hops for a message to traverse the network than on a ring network. As demonstrated, the topology of the peer to peer state server network is limited only by the imagination of the network designer. 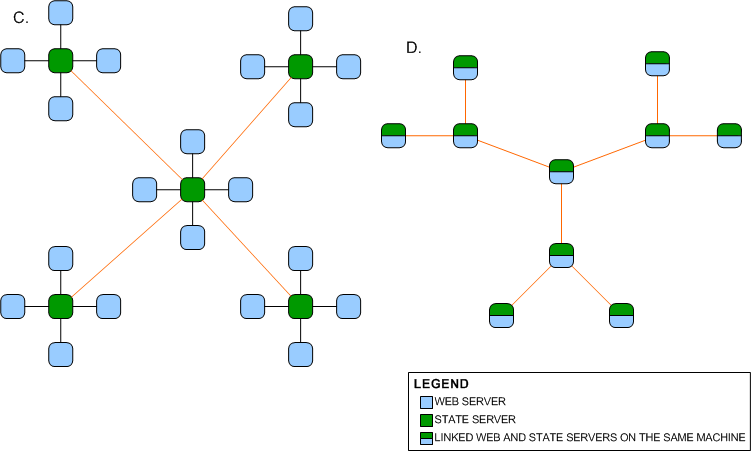 There are a lot of scenarios that occur in the state server that are handled using traditional peer to peer processes such as the time to live header which is used to prevent messages from circulating perpetually on the network, and message identifiers used by peers to recognize messages that have been seen earlier, however, there are two particular scenarios that occur in this peer network that are not so common. To ensure that session data is not lost during a server shutdown, the state server proceeds to transfer all its session state data to connected peers in a round-robin fashion when a server shut down is initiated. A request for a session on a network can narrowly miss the node holding the session if it is being transferred it as illustrated below. 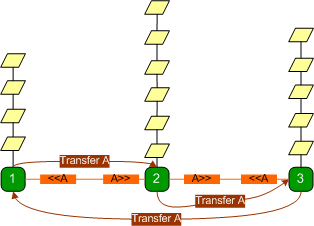 As shown above, node 1 is seeking session A from the network just about the same time node 4 wants to transfer the session to node 2. When the message from node 1 reaches node 2, node 2 forwards the message to node 3 because it doesn’t have the session. 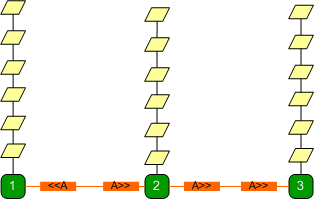 When the message reaches node 3, the session transfer between nodes 4 and 2 begins and by the time the message reaches node 4, the transfer is complete and node 4 no longer has the session anymore and forwards the message to node 5. Thus, the message traverses the network without reaching any node with the sought session, even though the session exists on the network. The state server addresses this issue by having nodes that recently transferred a session rebroadcast the message as shown below. Here, node 4 rebroadcasts the message so that it also travels back the way it came and eventually reaches node 2 which has the session. Rebroadcasted messages are duplicates of the original message except that they have a different Broadcast ID header which peers use to know it’s a different broadcast. As stated earlier, the state server uses a pessimistic concurrency model when accessing session state entries in the session dictionary. This works well because most requests take a short time to process. However, one particular request can take a much longer time to process, and can lead to resource starvation and performance degradation. A GetTransferMessage message broadcast is initiated by a peer when it needs to work with a session state it does not have. When the broadcast reaches a peer with the requested session state, the session state is transferred to the requesting peer. 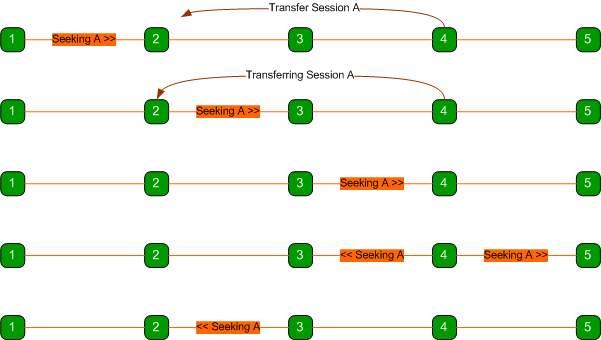 Unlike other operations on a session state, a transfer can take a significant amount of time because the peer has to connect to the other peer, possibly authenticate, and transmit (a potentially large amount of) data. It’s important to note that any request from the web server can kick start a GetTransferMessage broadcast. In the diagram above, a user is flooding a web application with requests, which in turn is causing session requests to be transmitted to a state server. Because all requests originate from one user, all session requests reference the same session id. 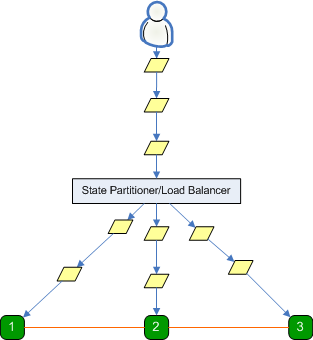 A load balancer or state partitioner distributes these requests among the three state servers. It is important to note that even though it is unlikely that a load balancer or state partitioner will distribute requests for a session among different state servers, a user can produce the scenario shown above by simply pressing and holding the browser refresh key on a web application that uses a poorly implemented state partitioner or a malfunctioning load balancer. Also, an organized group of malicious users (or a botnet) can produce this scenario even on properly functioning state partitioners and load balancers. Each state server has requests waiting to be processed. If the highly in-demand session is say, on state server 3, requests on that state server will be processed one by one very quickly. State servers 1 and 2 issue broadcasts requesting a session transfer. The message eventually reaches state server 3 and the request is transferred to say state server 2. Requests on state server 3 that were not processed will wait until the transfer is complete. After the session transfer to server 2 is complete, requests on server 2 are processed, whereas requests on server 3 issue broadcasts requesting the session. A broadcast that originated from state server 1 reaches state server 2 and the session is transferred to state server 1. This goes on and on and the servers keep transferring the session amongst themselves while most of the requests wait, because even when a session is transferred, the state server is only able to process a few requests before it is transferred to another state server. To make matters worse, if a state server receives a GetTransferMessage message after it has recently transferred the session, it rebroadcasts the message (as explained earlier), which leads to even more GetTransferMessage broadcasts on the network, more back-and-forth transfers and prolonged resource starvation. The transfer process is relatively slow and since all requests have to wait to be processed one at a time by each state server, requests start to time out and the web server starts discarding requests. The state server is unaware that the web server has discarded those requests and still proceeds to process them. These redundant requests, waiting for their turn, eat up valuable server processor cycles and degrade the quality of service. If plenty of these requests arrive, they'll quickly use up all processor resources and the server comes to a grinding halt. When a request is to be processed and the server notices the session is being transferred, the request stops being processed and is queued to be processed when the transfer is over. This prevents the request from eating up processor cycles while waiting, and frees up resources, so that other requests from other users can be processed. If the number of requests on a queue waiting for a session to transfer is too long, then all those messages are discarded because it means the session is contentious and the server shouldn't bother processing them. After the transfer is complete and a queued request is ready to be reprocessed and the server notices that the same session is been transferred again by another request, then the request will be discarded and not be processed, because it means the session is highly contentious. Before a request tries to query the network (by broadcasting) for a session, it checks if it is expecting a reply from a previous query for that session, and if so, the request is queued to a list of requests to be processed when the query is received. This reduces the number of GetTransferMessage messages that will be generated on the network, which in turn reduces unnecessary rebroadcasts and lookups. If the number of requests on a queue waiting for a session to arrive is too long, then all those requests are discarded because it means the session is contentious. This means that all session requests are treated fairly, no single user can significantly disrupt the rate at which messages originating from other users are processed. Additionally, if the queue for a particular session id is too long, that queue is discarded because it means that session is contentious. All these techniques employed by the state server can only adversely affect the web application of the offending user. The peer to peer state server is fully backward compatible with the Microsoft provided state server and can transparently replace it. Peer state servers can transfer sessions to each other, improving the reliability of session state dependent web applications. Peer state servers also act as a security layer that protects session data on the network. This project started out as a simple idea but quickly evolved into a complex task. Hopefully, this implementation and other ideas presented in this article will be valuable to developers interested in distributed systems. Due to the level of complexity, there will be bugs and kinks to work out. Contributions and bug reports will be appreciated. I've completely spec'd out the ASP.NET state service protocol and have published my findings. You can download it as a PDF document or view it in HTML format. The specifications will be very useful to anyone wishing to implement the state service. In my previous post, I took a first look at the ASP.NET state service communication protocol. In this post I'll describe the techniques I'm using to piece out and understand the protocol. I needed to monitor the traffic between the web server and the state service so I installed WinDump, a Windows version of tcpdump. With WinDump, I could capture the low level tcp traffic between the state service and the web server. The only caveat was that I had to monitor a state service on a different computer because WinDump doesn’t work with the loopback device. After a while I decided WinDump was too low level for the task at hand. What I really needed was a tcp relay server. A tcp relay server is a more involved version of an echo server that sits between a server and a client and relays transmitted data to and fro. With a tcp relay server, not only can I capture the transmitted data, I can also modify it. //is the state object instantiated and connected? // Retrieve the socket from the state object. It's important to note that the tcp relay server must also relay connections and disconnections from either end, in addition to transmitted data. 1. Create a new ASP.NET web application in Visual Studio. 3. Add the following lines of code to the Page_Load event handler. 4. Run the relay server. 5. Start the local ASP.NET State Service (Located at Control Panel -> Administrative Tools -> Services) . You'll see the gem below in the relay server console window. This tool will be extremely useful as I spec out my implementation of the state service. For instance, if I want to see how the state service reacts if there is no Exclusive header, I'll simply modify the TransformData method to detect and remove the header. I have also found Microsoft’s specification of the ASP.NET state service protocol. It doesn't look coherent but it will help me make my implementation compatible with their specifications. I have been thinking about developing an alternative ASP.NET State Service which can transparently replace the Microsoft-provided state service. To be successful, the alternative state service has to convince the web server that it is the state service. That means I need to know the high-level communication protocol used between the state service and the web server. How does the web server talk to the state service? Do they communicate via .NET remoting calls? Is there a proprietary protocol? Or is the state service really a fancy web service? I'll create an echo server that will listen on a port. I can then set the echo server’s address as the state service address for a web application. If the state service protocol runs over TCP, I should be able to see data transmitted by the web application. This configures the ASP.NET application to use the state service, except it's actually our echo server. I also add the following line of code to the web application's Page_Load event handler. Now, I start the echo server (actually a console application) and fire up the web application to see if any transmitted data is captured and displayed in the console window. I see a PUT verb followed by some non-standard headers, followed by some binary data. Well, that certainly makes my task easier considering that if the service was using .NET remoting calls; I'd have needed to delve into the innards of the .NET Remoting API. I also notice that the transmitted data is not encrypted. I can clearly see "Test Data" in the transmission. Um, Microsoft -- this is not good. How about the gibberish looking tidbit in the PUT statement? That must be some kind of identifier. I add the following line in the system.web section of the Web.config file to see if it will cause the data to be encrypted. No such luck, however, the encoded data in parenthesis in the PUT verb line changed. Hmm. Let's try to make some sense out of all these data. Host: The Hostname of the web application. Timeout: The number of minutes a session can be idle before it is discarded. ExtraFlags: No clue. I'll investigate. LockCookie: Looks eerily familiar. I'll investigate. This could be either information about an item to be updated, added or removed from the state service, in which case the web application retrieves and updates items as needed OR it could simply be a serialized list of all items to be stored in the session, in which case the web application reads all items at the beginning of a web request cycle and updates them at the end of the request cycle. To test my assumptions; I'll add a couple more lines of code to the Page_Load event handler. I then run the web application to see the transmitted data. I can see the new items I added in the binary data area. I can now conclude that at the start of a web request, the web application retrieves this list, possibly modifies it and sends it back to the service at the end of the request. Let me pause right here and think about this for a minute. Is this model efficient? Is it better to read all items in the session at once and update them all at once, or is it better to read and update items as needed? Well, since the items are stored by session ID and only one session ID is assigned to one user at any point in time. It means the chance that a session item is requested by multiple users/machines is negligible. Therefore there is no need to retrieve and update items as needed because there is no need for concurrency. Another advantage with this model is that the state service does not need to know about items being stored. It simply stores whatever data is sent to it. This makes development easier. Also, retrieving and updating items as needed increases the number of connections to the state service. This can greatly affect the scalability of a web application. The downside to reading and updating all items at once is bandwidth-related: If an application stores a lot of information in the session but uses only a few at a time, the web application will move a lot of unnecessary data to and fro, which may clog the network. This may not be an issue if your web server and state service are physically close or run on the same computer. A new question comes up; why is the web application NOT querying the state service for the session data when it starts? Does this mean any information already stored by the state service will be overwritten whenever the web application starts? I ended up with more questions than I began with and so I still need to investigate further but at least I have gleaned some basic facts needed to start working on an alternative state service. 1. The ASP.NET web server and the state service communicate via HTTP. 2. The state service stores the binary data sent by the web server (probably in a large dictionary) using the Session ID + a derivative of the machine key as the key. 3. The state service does not need to itemize the data to be stored because all items are read and updated at once. 4. The transmitted data is not encrypted (at least not by default). The state service is not concerned about this since it simply stores data.